Just Another Life Experience: Full run! We finished the war dance today, 4 mins of craziness that makes for an amazing section of the show. Yes it gets very tiring. My 1.2 (Leaning Tree Scene) went good tonight, still had some messy areas.oh well, this is why it is not opening night yet! :) I was very happy when Stevyn personally came to me and complimented my scene! This made my night! I was happy today to get on bob and trot a lot! He is a very good horse to learn your seat! I want to canter this horse so bad! 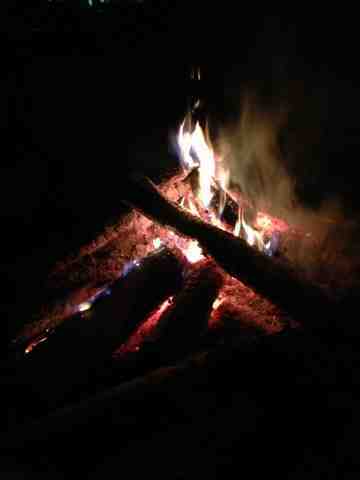 I close you out with a beautiful fire photo that we had last night! Btw if you want to try something, try a peanut butter cup s'more! They are amazing. I have not been able to take a lot of photos yet but once rehearsal is over j should be able to take more! Ps. This post is wrote on my phone, please excuse all typos. Oh, I want to canter, too, so bad. Cantering is the best!!!! Can't wait to see this dance. I imagine you are all working hard being that you put in 15 hour days, but yes in the end of these 3 weeks it will be amazing. So glad you are not letting the horse win, and you continue to work on that canter. Amazing you can trot but not canter, don't let Bob win. Lol. Also, glad to hear of your success in performing your scenes and that other members of Tecumseh have complimented you on your work. Keep reaching those dreams. Thank you all for reading! Sorry for not getting back to you all earlier! I will let you know if I ever get to canter!